Yukuse is the opposite of Eiji, though they are childhood friends. He is probably the first to have understood that Eiji has psychometry powers, and helps him with it. 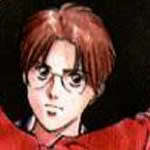 He is shy, intelligent and rational, which helps Shima and Eiji a lot when they are on a case. He likes Emi, but has hard time telling her.